Dads, have we got breakfast for you! 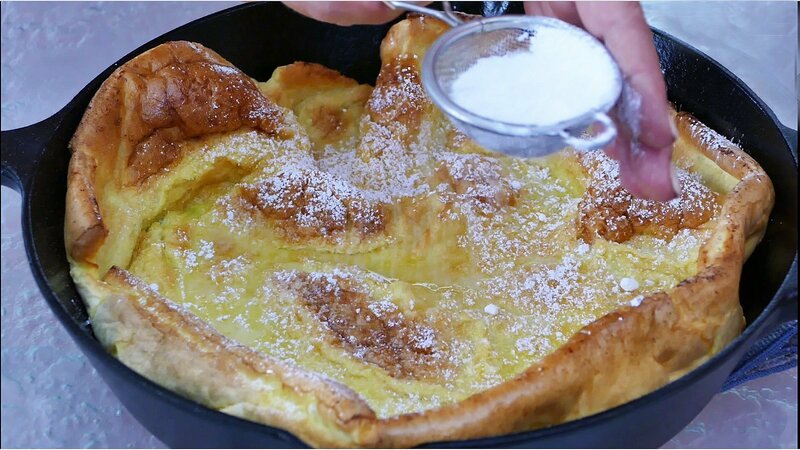 Okay, family, listen up – if you make him a German Pancake or Dutch Baby for Father’s Day, you’ll be treating him like the hero of the household that he is! If you’ve been bit by the cast iron cooking craze and happen to have a 10″ or 12″ cast iron skillet around, even better! But any oven-safe, heavy duty skillet will do. Are you worried that if you bake dad something special it may fall flat? Perfect! Then you’ve come to the right place. That’s exactly what a German Pancake or Dutch Baby does! It makes a huge, dramatic, puffy statement coming out of the oven, and then right before your very eyes, you’ll see it sinking, sinking, sinking. That’s when you pour a little clarified butter over it, squeeze some fresh lemon juice on it, and then give it a powdered sugar rain shower! Enter happy father to gobble it up. I can’t imagine any dad not loving this fantastic treat and the best part about it is how easy it is to make! Five everyday ingredients get you there, and you can top the German Pancake with just about anything dad loves, including fresh fruit, although the traditional way to serve it is with lemon juice and powdered sugar. There are no real tricks to making a perfect Dutch Baby, except that room temperature milk and eggs tend to create a fluffier pancake. If you’re using a cast iron skillet, get it nice and hot in the oven before you pour the eggs on. Other than that, you’re good to go! Crank up the oven to 425ºF and get the ingredients blending away. Pour dad a nice hot cup of java, tuck a napkin in his t-shirt, and then serve up a pan of sheer satisfaction! Happy Father’s Day, dads! You’re gonna love this one! Preheat oven to 425ºF. If using a cast iron skillet, place it in the oven while preheating. With a whisk, blender or electric mixer, blend together milk, eggs, vanilla extract, flour, and salt until batter is smooth and lump-free. Melt 3 tbsp of clarified butter (or regular butter, if you choose) in the preheated 10-12" cast-iron skillet. Pour batter into the center of the skillet. Bake for 20-25 minutes, or until pancakes is golden-brown and puffy around the sides and middle. When done, serve immediately. Finish with 1 tbsp of melted butter, fresh lemon juice, and powdered sugar.